NASA's mission to Mercury, named Messenger, will make its first of three flybys on Monday, January 14th, 2008. Following these three flybys, Messenger will be inserted into orbit around Mercury in 2011, a first for any space probe. It has been almost 33 years since Mariner 10 orbited Mercury in the mid seventies. Measurements made by Messenger will be the first close-up data from Mercury since Mariner 10's final flyby on March 16th, 1975. An artists' depiction of the Messenger spacecraft. A pre-flyby image of Mercury returned by Messenger. 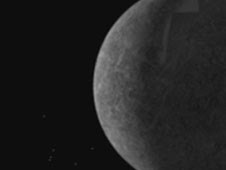 Mariner 10 mapped approximately one hemisphere of Mercury during its three flybys, including the huge impact basin known as Caloris. Caloris is one of the largest impact basins in the entire solar system, being about 800 miles wide. This is approximately a quarter of Mercury's diameter! Messenger's flyby and orbital data will help to fill in the gaps left by Mariner 10. Messenger will also analyze what little atmosphere Mercury does have, as well as the magnetic environment around Mercury. 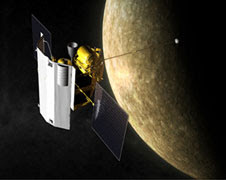 The probe will remain in functional orbit around Mercury for about one year. We should have some data and images from Mercury by Monday evening. I like visiting you site since I always come across interesting articles like this one. Great Job I greatly appreciate that. Now click here Cash Advance Do keep sharing!